I had a great reading week! I know that we all go through our little slumps in blogging. Times where it feels more like a chore. But this week, I read two great books that I really loved and it kind of reignited blogging for me! This is why I do it - to discover new authors that I otherwise may never have heard of. Reviews coming soon, I've been too busy reading to write! Right now, I'm reading The Charm Bracelet by Viola Shipman. It's pretty good, but I feel like it would have been better marketed as a beach book, it's definitely a summer read. An ad popped up on my Facebook feed today from Alfred Knopf publishers for a new book. The blurb in the top said it's "A More Literary and feminist Gone, Girl". I don't know why this irritated me so much, except that it seems like insulting a peer to promote oneself. I personally get sick of everything being touted as "the next Gone, Girl! ", it seems like lazy marketing. I only got one new add this week, which is fine because I finally feel like I'm getting caught up, getting three books read before their publish date! The Perfume Garden has sold especially well in Canada, where it was selected as Walmart's Read of the Month for June 2015 and made it to the Globe & Mail bestseller list. 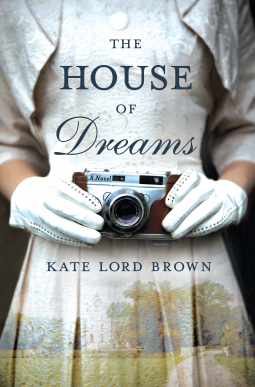 The House of Dreams combines Brown's lovely, lyrical writing and signature interwoven past/present narrative style with an even more commercial time period and a fascinating real-life story. In 2000, Gabriel Lambert is a celebrated painter who hides a dark secret. Sophie Cass, a journalist struggling to begin her career and with a family connection to Lambert, is determined to find the truth about his past and the little known story of the real Casablanca. In 1940, an international group of rescue workers, refugee intellectuals, and artists gather in the beautiful old Villa Air Bel just outside Marseilles. American journalist Varian Fry and his remarkable team at the American Relief Center are working to help them escape France, but "the greatest man-trap in history" is closing in on them. Despite their peril, true camaraderie and creativity flourishes - while love affairs spring up and secrets are hidden. At the House of Dreams, young refugee artist Gabriel Lambert changed the course of his life - and now, sixty years later at his home in the Hamptons, the truth is finally catching up with him.